A guinea pig hutch is designed specifically for pet owners who prefer to keep their pets outdoors, either through the summer months or all year round. If you plan to let your guinea pigs live indoors (as most experts recommend), then you should buy an indoor cage instead. Because they are constantly exposed to the elements, guinea pig hutches are much more sturdy in their construction than regular cages. The best hutches are made from thick, solid wood rather than flimsy plywood. This helps to make the hutch very solid, and will provide excellent insulation from the wind and rain. Perhaps most importantly, thick walls will keep out predators - animals such as rats can easily gnaw through thin plywood walls and attack your pets. A high-quality guinea pig hutch provides protection and warmth. You should be sure to choose a hutch with a solid floor. Some people recommend the use of hutches with mesh floors, such as you would find on a rabbit hutch, but these can be very dangerous and can easily result in your guinea pig breaking a leg after getting it trapped. To make a solid floor more comfortable to walk on, you should cover it with several sheets of plain black and white newspaper, and a generous layer of hay. A good guinea pig hutch has a solid roof which slopes from front to back, to help channel water away and stop it sitting on the roof, causing it to rot. 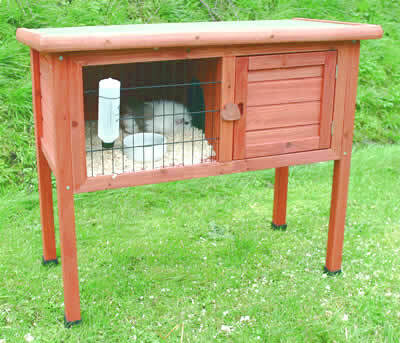 Also try to find a hutch with a large overhang on all sides. Again, this helps to keep rain away from the walls of the hutch, and from your pets. Guinea pigs don't like to get wet, and this will help to provide some protection. 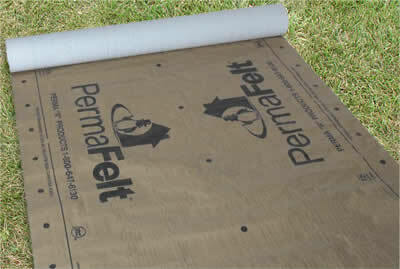 The roof should be covered in 2 or 3 layers of roofing felt to make it waterproof. Roofing felt is perfect for weather-proofing your guinea pigs' hutch. The fronts of most hutches are divided into two distinct sections. The first is a large door, typically around two-thirds of the width of the cage, which has a mesh front. 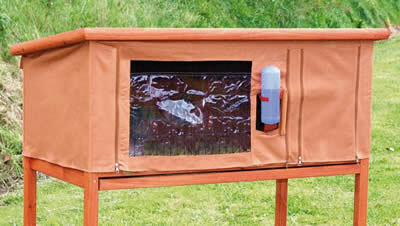 This allows air and sunlight into the hutch, and also allows your guinea pigs to have a view into your garden. The downside to this is that it makes your animals easy to spot for predators. To help protect against this, make sure the mesh is securely fixed, and keep an eye on it for any signs of damage. Many predators, such as foxes and badgers, are surprisingly strong, and can easily lift this front door. Therefore you should fit it with a strong bolt, and fasten with a padlock if necessary. Most hutches have an 'open' area to let light and air in, and an enclosed area to provide shelter and privacy. The second part of the hutch front is a solid panel, which is also sometimes hinged to provide a second door. This panel produces a shaded area inside the hutch, which provides excellent shelter from bright sunlight and rain, and is also an excellent place for your pigs to get some peace and quiet. Again, if this section is hinged, be sure to fasten it securely. In order to protect your hutch from rot, it needs to be coated in a preservative to protect it from rain, and from your guinea pigs' urine, droppings, and spilled water. It is essential that you choose a preservative which is safe for animals, or you may end up accidentally making your pets ill. If you intend to keep your hutch indoors, for example in a shed, then this step is less critical, but it can still help to extend the life of the hutch. 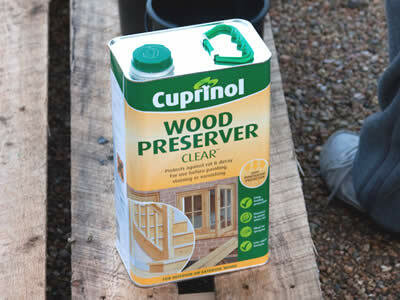 Use wood preserver to seal your cavies' hutch and protecting it from rot. Image by Mr ATM. In the winter, it is important to protect your pigs from the elements. Their hair will naturally thicken to provide extra warmth, but you still need to shelter them from rain and wind. If possible, move the hutch inside, into a shed or other building. Alternatively, you can hang a hutch cover or piece of carpet over the hutch to provide protection, but don't leave them like this all day, as they like to get plenty of sunlight. A hutch cover provides extra shelter and protection from the elements. 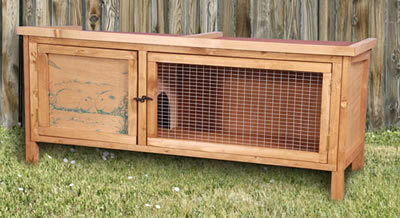 An important consideration when buying a hutch is what size to get. As with all types of guinea pig cage, bigger is better, as cavies are considerably larger than most other small pets. You should give your animals plenty of room to run around, and space to be alone when they want to be. It is important to have a large, unobstructed area so that they can run around at full speed. They love to do this several times a day, and it helps to keep them healthy and happy. A common type of hutch is the dual-storey hutch. These provide two layers for your guinea pigs to live on, but without taking up any more floor space. These can be great, but you should bear in mind that your pets still need enough room to sprint around without having to go up and down layers. Also, although these can provide a second floor for your pigs to use as an exercise area, you should still provide them with a dedicated guinea pig run to help keep them fit. Choosing a location for your guinea pigs is very important. They need to be placed in a bright, dry area, but out of direct sunlight, and facing away from the prevailing winds. Try to choose somewhere which has a fairly constant temperature throughout the day. Guinea pigs cannot cope with temperatures which are too hot or too cold. A good rule of thumb is that if it's uncomfortable for humans, it's uncomfortable for guinea pigs too. You should not place your guinea pigs' hutch directly on the floor, as it can get very cold, and is more susceptible to rotting. Instead, raise it up by placing it on a table at about waist height. Some hutches have built-in legs designed specifically for this purpose. Raising the hutch up helps to protect your pets from predators, and gives you easy access when you want to play with your pets or clean the cage out. When it comes to 'furnishing' your guinea pigs' hutch, choose a heavy food bowl which will not be easily tipped over. Water is best supplied fom a bottle attached to the hutch's mesh front - water bowls tend to get filled with hay and food pellets, making the water unsuitable to drink, and the cage harder to clean. Your pets will also appreciate it if you give them a selection of toys and accessories to keep them entertained and stimulated. Be careful not to go over the top though, as these can take up valuable living space. One final consideration is purely for the wellbeing of your pets. When your guinea pigs' hutch is located outside, it can quickly lead to them being forgotten, and left for days on end without any significant human contact. A guinea pig left like this will soon become depressed. Be sure to play with your pigs at least once a day, and visit them at various intervals throughout the day where possible. This will help them to feel loved and like part of the family. There are a huge number of pet stores and websites which stock a range of hutches for sale, or if you're a practical person you might even consider buying plans showing you how to build a guinea pig hutch. Whichever option you decide on, be sure to remember the points mentioned above, so that you can give your guinea pigs a home they'll love.